The Volkswagen Corrado replaced and succeeded the Scirocco, both cars representing Volkswagen's flagship high-performance limited-production sports coupe model. The Corrado name is derived from the Spanish verb “correr” which means in English “to run” and became loosely translated as “to run fast.” As with many other Volkswagen models, the Corrado is also the name of a wind current or jetstream. The Corrado's test prototype name was known as “Typhoon” by Car and Driver magazine. All Corrados were assembled by Karmann Coachworks, an independent specialty shop in Osnabrück, Germany, which has a long history of contract work with Volkswagen and other German automakers. Wilhelm Karmann GmbH began in 1902 as a coachbuilder and their first major endeavor was the 1949 VW Beetle Cabriolet. However, they are best known for their work on the VW Karmann Ghia, which was introduced in 1955. Karmann has also produced the VW Cabriolet and Cabrio, the Scirocco, the Porsche 356 and 914/916, and they are currently contracted to assemble the convertible top for the proposed AMG-prepared Mercedes S-Class Coupe Cabriolets. The Corrado was introduced in Europe, England, and Canada. It was immediately identified as a true Volkswagen becuase it was so very different. The styling was chunky as opposed to the aerodynamically-sculpted-look of the time. The engine had a supercharger as opposed to the more popular turbocharger. VW had hoped that being different in the 1990s marketplace would have the same success it did in the 1960s and 1970s with the Beetle. Corrado owners loved the exclusivity of the styling but the performance was mediocre. The factory published a 0-to-60mph time of 7.5 seconds but no media reviewers could manage that number. Most drivers could only muster a best time of 8.2 seconds. The engine consisted of a G- lader (German for supercharged) intercooled 1.8-liter SOHC inline 4-cylinder iron block with alloy heads. While all superchargers are engineered to respond with a power boost throughout the entire RPM range, VW had specifically tuned the Corrado's supercharger for mid-rpm response which gave the direct impression of turbocharger boost lag in the lower rpms, something superchargers were supposed to eliminate! Power delivery began around 2000 rpm but the meat of the power was between 3000 and 6000 rpm. AutoWeek magazine noted the impressive lack of torque steer. However, the manual shifter was noted for its notchy and sloppy action. The German engineering evident in the Corrado, that is, the high-level of quality in minimalist technology, caused many road testers to question the need for other (Japanese, specifically) car manufacturers to offer variable-ratio steering, electronically-adjustable shocks and four-wheel steering. The 1990 Corrado was equipped with power-assisted vented front disc brakes and solid discs in the rear. ABS was offered as an option. 15-inch alloy wheels were standard, as were 195/50HR15 tires, typically Pirelli P600. The active aerodynamic rear spoiler, which automatically raised at 45 mph (US) and lowered at 12 mph, received criticism for blocking the view through the rear window, especially since its effectiveness for reducing lift only became significant far beyond any legal speed limit in the US. The Corrado's rear seats were praised by everyone for their practical ability to seat two adults comfortably - something no other car in its class could do as well (the nearest contender being the BMW 3-Series Coupes). AutoWeek concluded that while the Corrado took the road less traveled, by doing things differently and arriving at much the same result, the Corrado offered buyers a large service by offering them a choice. In VWOA's advertisements, sparsely made available, the Corrado was promoted as a model of innovation: “producing more power at lower engine revs without the lag of turbo charging; low drag coefficient of 0.32; rear spoiler automatically raises at 45 mph to reduce rear end lift as much as 45% - a feature once available only on Ferrari or formula race cars.” The US base price was $17,900. Standard features included air conditioning, leather steering wheel, power windows, power mirrors, heated mirrors, anti-theft Heidelberg am/fm/cassette stereo, trip computer, cruise control, rear window wiper/washer, central locking, fog lights and the speed- activated rear spoiler. Options included ABS for $835, sunroof for $695, leather interior for $710 and a cold climate package for $250 which consisted of heated seats and heated windshield washer nozzles. The US-market Corrado carried-over much of the 1990 model. Already, lackluster sales prompted the availability of a 4-speed automatic transmission as a new option for the 1991 model year, in hopes of expanding the customer base of the Corrado. As tested by AutoWeek, the automatic was a favorable alternative to the notchy and imprecise-shifting 5-speed manual. Zero- to-60mph was 7.7 seconds - better than the manual by some tests. Still, the G60 engine seemed to be the source of disappointing performance. Also during this year, Volkswagen in Wolfsburg, Germany, had produced an internal one-off study of a G60 Cabriolet. The official published photo indicates the rear seats were removed to facilitate storage of the softop - good enough reason why this study vehicle never became approved for production. Had Karmann Coachworks been commissioned to do the job, we’re sure they would have successfully been able to convert the Corrado into Cabriolet form and retain the rear seats, much like their conversion of the Golf model into a Cabriolet. This was the only model year that two engine choices were offered on the Corrado: the G60 and VR6. While the G60 model was phased-out through the first half of the year, the VR6 (badged SLC in the US-market) was phased-in through the second half of the year. Eager to erase the G60 model from customer's memories, Volkswagen focused its sales pitch on the new VR6 engine and its ability to transform the Corrado into a rocket on wheels. The innovative 15-degree V6 engine developed 178-hp and 177lb-ft of torque and won Popular Science's Best of What's New Award for 1992. The compact design allowed the muscular engine to be fitted into engine bays originally designed for 4-cylinder engines with almost no modification. In years that followed, the VR6 engine would become available in all other VW products, but it was only in the Corrado that the VR6 demonstrated its full performance potential. Standard features on VR6 models included: traction control (also known more precisely as electronic differential lock) which operated at speeds up to 25 mph and used the ABS wheel-speed sensors to apply braking pressure to a driven wheel that was spinning 110 rpm faster than the other (this allowed for some wheelspin but brought the offending wheel back down to speed of the wheel with good traction). The traction control system also had a brake heat monitor system to prevent overheating. The VR6 model included Koni shocks which produced a softer, more compliant ride than the Bilstein-equipped G60. 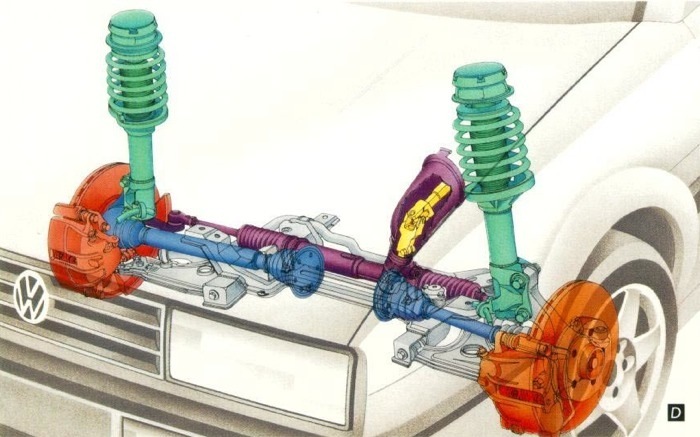 All VR6 models came with Plus-Axle (see picture) front control arms that allowed an increased negative steering radius, the net result being reduced torque steer. New styling elements included convex-style BBS 15x6.5 alloy wheels, wider 205/50VR15 tires (Continental CV90 and Uniroyal Rallye 440 were US OE), clear front turn signal lenses, a “bulged” front hood and red-painted badges (VR6 in front, SLC in rear). Curb weight increased to 2837 pounds with a 60.9%/39.1% front/rear weight distribution ratio. The Corrado VR6 competed with the Porsche 968, BMW 325is, Nissan 300ZX, Mitsubishi Eclipse GSX, Honda Prelude VTEC, Ford Probe GT and Toyota Celica GT. And by all accounts, the Corrado VR6 bested all of their 0-to-60 times! Car and Driver returned the quickest published time of 6.4 seconds and 141 mph top speed (June 1992). Seven body paint colors were available for US-market 1992- model year Corrados: Green Pearl Metallic, Satin Silver Metallic, Dark Burgundy Pearl Metallic, Aqua Blue Pearl Metallic, Jasmine Yellow, Flash Red and Black. The 1992 VR6/SLC MSRP base price was $21,840. Four options were available: automatic transmission, leather interior, power sunroof and the cold climate package. The Corrado VR6 enjoyed a new resurgence in sales thanks to its new engine and rave reviews from magazine testers around the world. To further distinguish the new Corrado from its G60 siblings, VW gave the Corrado an exterior and interior freshening for the 1993 model year. US- market Corrados were fitted with Speedline 5-spoke alloy wheels (same 15x6.5 size as '92 SLC) and same size tires (205/50VR-15). US and worldwide Corrados received some substantial interior improvements: newly-designed instrument gauge faces with red-colored indicator needles, redesigned dash controls (dip-switch- type changed to push-toggle buttons), HVAC-style climate controls replaced the horizontal slider control unit, the center console storage box was deleted in favor of two additional gauges (oil pressure and battery voltmeter), the door-mounted window controls were relocated to the door storage compartment housings, a sunroof-closing feature was added to the window-closing central locking system, the door-mounted speakers had the amplifiers moved from the doors to the Premium stereo tuner, and a trunk-mounted remote CD changer was available as an option for the first time. Five paint colors were offered on US-market Corrados: Black, Flash Red, Classic Green, Dark Burgundy Pearl and Satin Silver. Beige or Black leather was available as an option, but most US- bound cars arrived onto dealer lots with leather and sunroof options. Automobile Magazine added the Corrado SLC to its annual All-Star picks for 1993 (based on the review of the 1992 SLC). This became the last model year of the Corrado in the United States. The US-market Corrado in 1994 was fitted with H-speed rated Goodyear tires (a step-down from the V-speed rated OE tires from previous years) and a speed governor set to 130 mph to match the new tire limitations. Also new for 1994 was a new color: Mulberry Metallic which resembled a plum-purple hue. The 1994 MSRP with leather and sunroof had risen to around $28,000 US. Some 1993 Corrados were still available throughout most of 1994 on dealer lots. Automobile Magazine once again picked the Corrado SLC for its All-Stars for 1994 (based on a review of the 1993 SLC). This was the final year of Corrados produced for the remaining global markets. A special commemorative edition model, the Corrado Storm, was produced for European and British markets only (it was never exported to Canada or the US). The Storm model came with Aqua Blue Pearl Metallic paint, 6-spoke BBS wheels (same size as other VR6 models), leather interior, sunroof, Sony stereo system and chrome-polished Storm/VR6 badges. Without much fanfare, the Corrado disappeared from VW showrooms by year's end. During its 7-year production run, Karmann had assembled 97,521 Corrados. By comparison, Karmann had built 291,497 series II Sciroccos and 504,153 series I Sciroccos. Note: prices listed are current through the spring 2000 season, reflect US retail value from below average to above average condition cars, average condition based on 12,000 miles per year and properly maintained and in good reasonable condition. In summary, the Volkswagen Corrado was a great successor to the Scirocco and once the VR6 engine became available in 1992, it was a car with few peers in its class. The VR6 was so good, that many said it was worthy of a Porsche badge. Certainly it could have sold equally-well as an Audi Coupe, the Volkswagen- owned luxury car maker. But that flattery just emphasized the bargain the Corrado was by being a Volkswagen. Strangely enough, the Corrado did not sell well, in the US and worldwide. Theories why abound. Lack of aggressive marketing and advertising. Poor and/or changing economy. Volkswagen's economy-car poor- reliability image problems. But despite the lack of enthusiastic sales, the Corrado still holds a piece of history as being the quickest and fastest Volkswagen ever made by the factory to-date and certainly the all- around best car ever to be produced by VW. While collector-car status does not yet seem to be part of the Corrado's current afterlife, this underscores the bargain it still offers, if not in the showroom but now in the used car market. Comments on "A Brief History of The Volkswagen Corrado"